I did so good all winter not getting sick. We finally got a tiny bit of warm(er) weather and sure enough. Jacob and I both were out for the count. On a plus side, we were able to crash watch both seasons of House of Cards (sooooo good!) I was a little worried that with being so out of it this week I wouldn’t do so well on the scale but I tried my best to stay on plan. Last weeks weigh-in was quite a shock. Somehow I managed to lose 4.2 lb. which gave me a 5 lb star. and then this week I lost another 2 lbs. Which now brings my total since September 1 to 62.8 lb. That is an insane number to me and even though its just a few pounds a week and in another mindset i’d probably think it wasn’t good enough, it adds up. 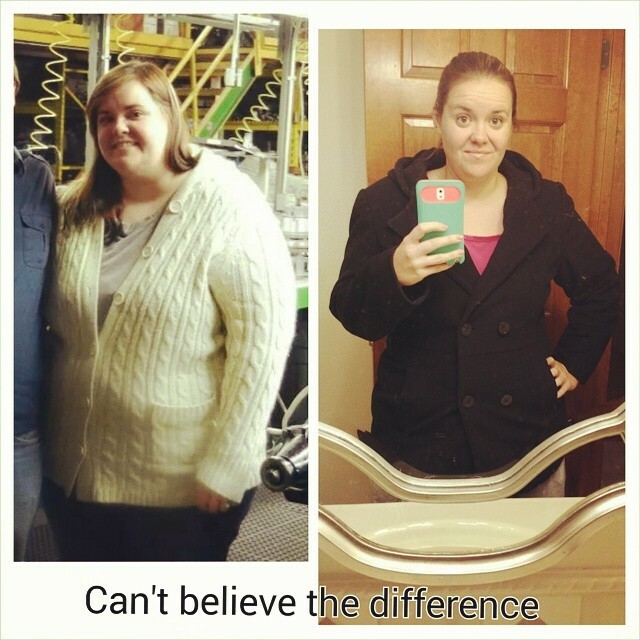 i’m still a long way away from my goal. But it was rather encouraging for the leader of the meeting I go to to ask me about my end goal (as in what weight i’m shooting for to get my lifetime) She said “normally I wouldn’t talk to someone about goal yet. but that you seem like you have a really good handle on things and that a long term goal won’t discourage you and will push you. and I think you’ll be there before you know it.” wow. that was really encouraging to hear. Believe it not I want to lose at least another 100 on top of where I’m at now (that will put me at a healthy BMI I’m not trying to go too crazy) I don’t want to get too caught up though in the end goal. right now i’m anxious for 75 lost. that’s my next “bigger” goal and I’ll just keep building from there. 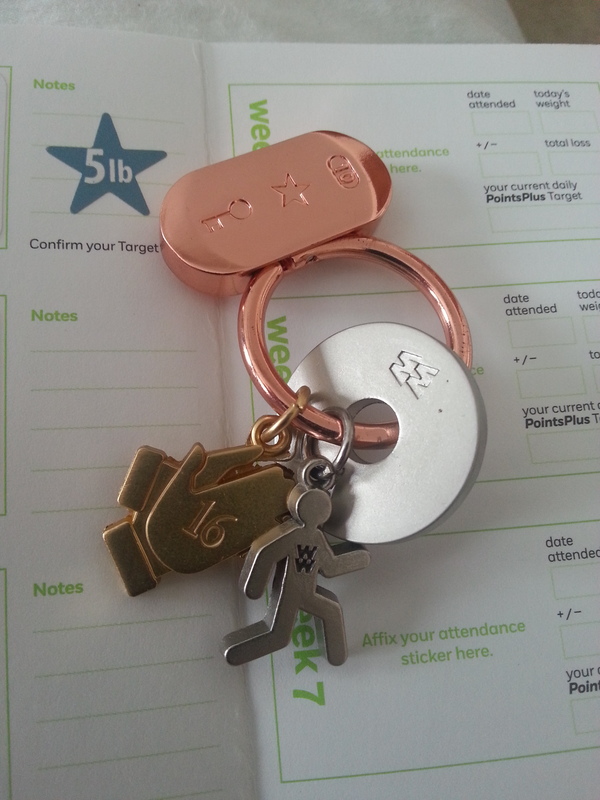 Weekly Weigh-in and catching up. The gold washer is the 50 lb charm. Feels good to have that guy. Can’t wait for my next washer which will be at 75 lb lost. That one especially for some reason will seem unreal. So when I get that one I’m sure you’ll hear right away lol. the rest of my weigh ins are as followed…. Looking back over my blog it appears I’ve missed quite some time since my last update. I’ve still been working and doing well. I just haven’t been up on updating really anything online. The last time I posted was from my weigh-in on 12/15 in which I was at 43.4lb lost. I’ve weighed in twice since then. Although this week I did not weigh in because we got a pretty large winter storm so I missed my weigh in day and wasn’t able to even think about going till like 3 or 4 days after. So I decided I would just wait and not weigh in…oh well. So here are the updated stats. My 16 week hands. 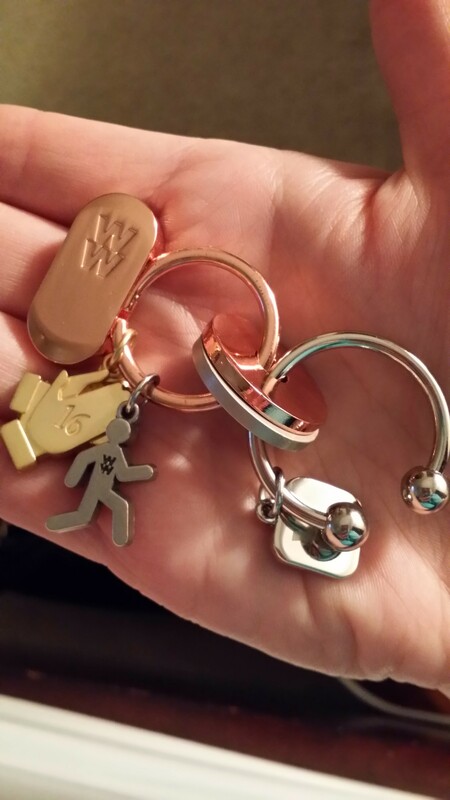 Getting lost of bling 😀 Hopefully very soon I’ll get another charm…which is my 50 lb ring. This weeks weigh-in total: down another 3.4 lb this week 😀 which brings me to 43.4 lb lost 😀 I think it might just be possible to pull off 50 lb BY New Years. I’m really hoping to pull that off. That would be a pretty good goal to hit especially over christmas and all the temptation the holiday brings. But hey…a loss is a loss so I won’t fret over what the loss is. It all adds up eventually anyways. Man oh man, have things been busy and rough for the last 2 weeks. Sorry I didn’t post last week but I’ll explain. Well the week of Thanksgiving was a busy one for sure! All sorts of projects and things leading up to Thanksgiving as well as my first “race”. Thanksgiving day Jacob and I did the Gallopping Gobbler, a 4 mile run. We didn’t aggressively train for it but we were able to complete it strong. After the race we had 2 Thanksgivings to go to…Trying to track and watch everything is hard enough when you don’t control the meal, but trying to do so at 2 different houses made it interesting. While at our second Thanksgiving of the day Jacob got a call from his dad, Mike, saying Jacob’s mom was having some issues and he didn’t know what to do. So we stopped what we were doing and went straight over. Jacob’s mom has been sick for quite a few years with breathing problems. She has emphysema and because of that she’s been on oxygen full time for about 4 years now. When we got there Mike was pretty concerned about Jane and of course Jane insisted on not going to the hospital. After talking with my mom (who’s a nurse) we tried to see if she could do a breathing treatment and she was just too weak so we opted to call for an ambulance (all this happened in maybe 5-10 minutes from the time we got there) The ambulance got there and got Jane. Mike rode in the ambulance there and Jacob and I drove to the hospital in our car. When we got there, we headed to the emergency side. And then found Mike. He told us Jane didn’t make it and that she had passed away shortly after getting there. It’s been rough. Jane’s been sick for a while now and I know she hated that she was unable to do all the things she used to.I know it’s been rough on Jacob to of seen his mom in such bad shape, but, it was blessing to of been able to see Jane one more time and Jacob was able to tell her he loved her. We already miss her, although we know we can find comfort in that she’s in a better place and not suffering anymore. With everything we’ve been out of the house and going a mile a minute. Because of that 2 weeks ago my weigh-in was actually up 1 lb Considering everything that’s not too bad. It’s my first ‘gain’ since starting but hey…one pound isn’t too bad. so my total weight down as of last week was 36.2lb. Thank you everyone for all your support both personally with Jacob’s mom and with my weight lost journey. You all mean more to both of us then you could possibly know. Sorry I’m so late with my weekly check-in. With Thanksgiving this week and everything around it, it’s been an insane week already. Change of plans.... we thought we had preschool planned for miles. But we looked into @pinehillcountryday and fell in love. When you know...you know lol. Miles can't wait to start.